Steel Plantech can propose cold rolling mills (CRM) or state-of-the-art tandem cold mills (TCM) according to the customer’s needs. Furthermore, the ZOOM (zero oriented off-gauge minimization) function developed by Steel Plantech can be added to improve yield ratios and reduce production costs as compared to conventional CRMs. By adopting the Zoom-Mill™ developed by Steel Plantech, you can reduce production costs (reduction in off-gauge sheets), recover the investment quickly, and increase revenues. 1Removing the Pup Coil has done away with the Pup Coil extraction process, realizing a reduction in required processes. 2Less time is required to exchange a coil as compared to ordinary cold rolling mills, ensuring a high production volume. 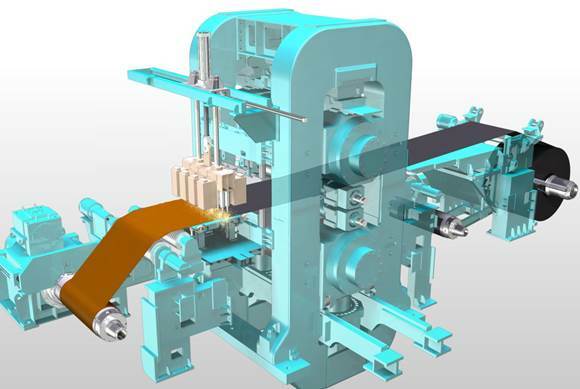 An existing cold rolling mill (CRM) can be led into a Zoom-Mill™. This allows increased productivity from an existing CRM while at the same time reducing production costs with minimal investment. Furthermore, it has been remodeled for use with the CRMs of other manufacturers. It is characterized by the fact that renovation ends with short shutdowns, making it possible to recover the investment for renovation in a short amount of time. The Zoom-Mill™ rolling method was developed by Steel Plantech with the purpose of minimizing off-gauge sheets in reverse rolling by applying a leader strip and a spot welder. Zoom-Mill™ rolling improves off-gauge rolling ratios by 1% as compared to conventional rolling mills. In the case of 6-pass rolling, the length of the off-gauge portion of the coil periphery will usually be more than 10 meters. However, the use of the Zoom-Mill™ rolling method will enable a finish with the off-gauge at less than 2 meters. Because tensile force can be added from the tip of the chord when rolling, the Zoom-Mill™ rolling method is superior to other methods for reducing off-gauges during reverse rolling, with better threading stability, plate thickness precision and shape. Because the next strip is held above the threading on the outside tension reel while waiting for the rolled coil to go offline, there is no need to wait to wind rolls, making it possible to decrease processing time per coil even if the welding takes time. Therefore, you can expect improved productivity by adopting this method. 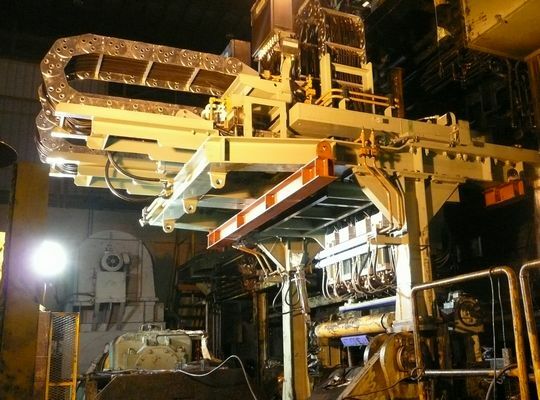 Furthermore, it leads to the saving of labor since it prevents the generation of off-gauge small coils (pup coils) and does away with the need for tasks such as the extraction of small coils, strapping, discharging and disposal.